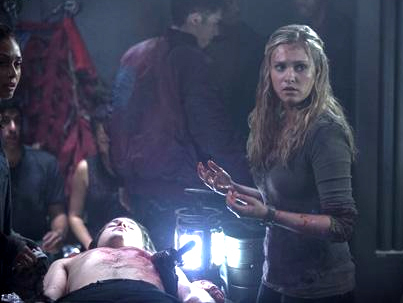 While a hurricane bears down on the encampment, Raven tries desperately to make contact with the Ark so that Clarke can get help from her mother in saving Finn’s life. Meanwhile Bellamy questions a captured Grounder, and on the Ark Jaha and Kane deal with the fallout of their recent decision. KATE VERNON ("BATTLESTAR GALACTICA") GUEST STARS IN THIS EPISODE - Clarke (Eliza Taylor) and Raven (guest star Lindsey Morgan) make contact with the Ark, and Abby (Paige Turco) guides Clarke through a dangerous procedure in a desperate move to save one of their own. Meanwhile, on the Ark, Abby is removed from the council, and former Chancellor Diana Sydney (guest star Kate Vernon) takes her place. Jaha (Isaiah Washington) reveals to Abby that there are not enough drop ships for everyone on the Ark to go down to Earth, and Kane (Henry Ian Cusick) begins to deal with his guilt over his recent decision.